Think all those bright yellow fields are canola? They're not. Island farmers are growing about 15,000 acres of mustard this summer as part of an ongoing battle against the wireworm, a pest that cost the P.E.I. potato industry $6 million in 2014. Think all those bright yellow fields are canola? They're not. Island farmers are growing about 15,000 acres of mustard this summer as part of an ongoing battle against the wireworm, a pest that cost the the P.E.I. potato industry $6 million in 2014. "It's been one of our biggest battles growing potatoes here," observed Willem VanNieuwenhuyzen of Vanco Farms. "For years it seemed like it was getting worse and worse, and it's a bit of a helpless feeling knowing there's not a lot out there that we can use to battle it. "Hopefully this mustard is our golden ticket, that's kind of what we're all banking on." Wireworms dig holes in potatoes as they grow, making them unfit for sale. The farmers don't harvest the mustard, but mulch it and plough it into the soil. As it breaks down, the mustard gives off a bio-fumigant into the soil that kills wireworm and other pests. Wireworms live in the ground, beyond the reach of insecticides sprayed on the surface. 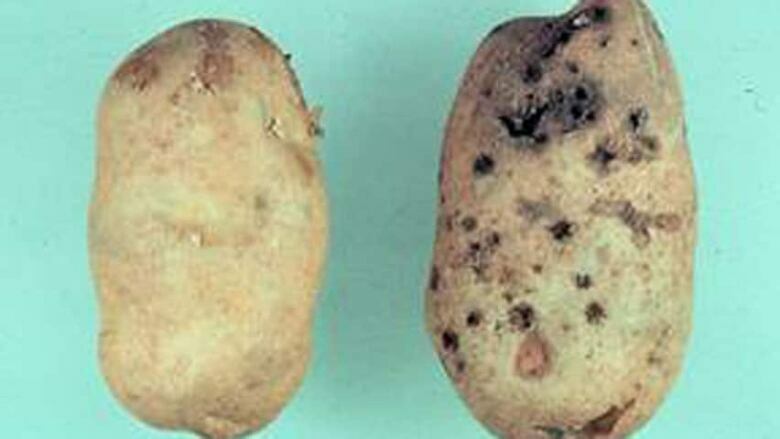 The insects dig holes in potatoes as they grow, making them unfit for sale. "It's been pretty substantial to the industry. We buy with our eyes and when you see a potato that's been damaged by wireworm, people just don't want to buy that," said Dan MacEachern with the P.E.I. Department of Agriculture. Vanco Farms, for example, had one field last year that was hit hard by wireworm and cost them half of the crop. That's why Vanco has planted more than 2,000 acres of mustard this year in all the fields where potatoes will be planted next season. "We're calling ourselves mustard farmers now because we seem to grow more mustard than anything else," joked VanNieuwenhuyzen. Mustard doesn't generate any revenue but VanNieuwenhuyzen hopes it will pay off. "The potatoes we pack are expensive and wireworm damage is hard to pick out," added VanNieuwenhuyzen. "We're hoping that the benefits of the next year's crop will justify this." Vanco Farms also has a summer student monitoring traps in its fields that capture click beetles. Female click beetles can lay 100 to 200 eggs that produce the destructive wireworm larvae. For VanNieuwenhuyzen, it's all about "knowing the enemy." "I think we're seeing some improvements. I hope we're getting it under control. That's our goal and I think we're getting there." The amount of mustard being grown this season is up 25 per cent and MacEachern expects that number to remain stable. "I don't see them decreasing any time soon — if anything maybe acres will increase a bit just because it's a nice, natural way to help improve the soil," said MacEachern. The fields of bright yellow mustard have been attracting attention. "The department has received a lot of calls this summer and they're inquiring as to why there's so much canola being grown on the Island this year," explained MacEachern. "And it turns out it's actually mustard."